Hi Rosemary, I now have the lost blue rabbit, that was in fact a puppy dog. My little boy is happy again, and so am I. Thank you for your help. HI, please can anyone help? I have lost my little boy’s blue rabbit (we now know it is a dog, not a rabbit) comforter (called baby) that he has had since birth. He’s very sad without him and is finding going to bed a real struggle. 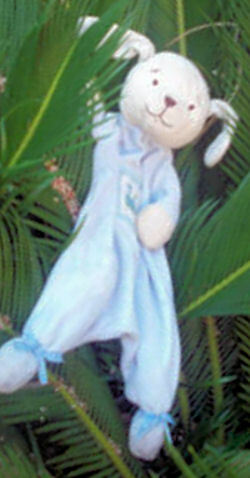 He is blue, with an empty body, long ears, arms and legs, and has small blue bows around his feet. And it has a square motif of some kind embroidered on its body, and he also has a cream colored head. I have searched and searched web sites and shops, but can not find one. If anyone has one they no longer use or know where I can buy one, please let me know. Thank you Tami for your repy and your help in finding the puppy dog for me (and not a rabbit as i thought it was!!!! )I am so delighted and am very gratfull to you so again thank you soooo much.